Your patio door hardware is the main point of contact between the person using your door and the door itself. It needs to look good and feel great to the touch. You can customize our patio doors with many different h andle styles, including Anvers®, Yuma®, Encino®, Tribeca®, Newbury®, Whitmore®, Albany, and Covington™. We have door styles for both contemporary and traditional homes. You can also choose a premium hardware finish. Our options include Satin Nickel, Antique Brass, and Oil Rubbed Brass. You can also customize our sliding patio doors in St. Louis with our decorative glass. You can choose from a reed, fern, cascade, or obscure pattern. Our glass options are also highly energy-efficient. Our decorative glass features a multi-layer spectrally selective low emissivity coating that minimizes heat transfer. This keeps your interior comfortable and can reduce your utility system’s energy consumption. Depending on your home’s structure and the weather, you can save up to 25% on your energy bills. 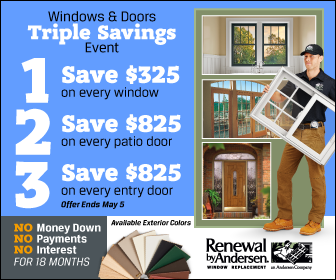 Renewal by Andersen carefully selected our patio doors’ interior finishes and exterior colors to harmonize with a broad range of building styles and color schemes. Exterior colors include canvas, white, s andtone, and Terratone®. Our interior finishes include pine, maple, and oak. You can also stain these interior finishes to match your decor and furnishings. If you wish, you can match your interior with your door’s exterior color. During our initial meetings, our door expert will help you select the best color and finish for your home’s particular style. Our St. Louis French doors and contemporary sliding doors will enhance your patio’s appeal. In addition, they can make your interior more comfortable and energy-efficient thanks to our doors’ weathertight construction and High-Performance™ Low-E4® glass. If you need more help designing the perfect patio door for your outdoor space, then give us a call. We are always ready to assist you. Call us at (314) 332-2364 to learn more about our patio door customization options. You can also ask for a free estimate.